The New Yorker, June 19, 2006. Earlier in my life there seemed to be unlimited possibilities, but my mind was closed. Now, years later and with an open mind, possibilities no longer interest me. I seem content to be continually rearranging the same furniture in the same room. My concern at times is nothing more than establishing a series of practical conditions that will enable me to work. For years I said if I could only find a comfortable chair I would rival Mozart. My teacher Stefan Wolpe was a Marxist and he felt my music was too esoteric at the time. And he had his studio on a proletarian street, on Fourteenth Street and Sixth Avenue. . . . He was on the second floor and we were looking out the window, and he said, “What about the man on the street?” At that moment . . . Jackson Pollock was crossing the street. The crazy artist of my generation was crossing the street at that moment. If a man teaches composition in a university, how can he not be a composer? He has worked hard, learned his craft. Ergo, he is a composer. A professional. Like a doctor. But there is that doctor who opens you up, does exactly the right thing, closes you up—and you die. He failed to take the chance that might have saved you. Art is a crucial, dangerous operation we perform on ourselves. Unless we take a chance, we die in art. Because I’m Jewish, I do not identify with, say, Western civilization music. In other words, when Bach gives us a diminished fourth, I cannot respond that the diminished fourth means, O God. . . . What are our morals in music? Our moral in music is nineteenth-century German music, isn’t it? I do think about that, and I do think about the fact that I want to be the first great composer that is Jewish. These quotations are taken from three collections of Feldman’s writings, lectures, and interviews: “Morton Feldman Essays,” which was published in 1985; “Give My Regards to Eighth Street,” which appeared in 2000; and the new anthology “Morton Feldman Says,” edited by Chris Villars (Hyphen; $50). The books testify to the composer’s rich, compact, egotistical, playful, precise, poetic, and insidiously quotable way with language. The titles of his works make music on their own: “The Viola in My Life,” “Madame Press Died Last Week at Ninety,” “Routine Investigations,” “Coptic Light,” “The King of Denmark,” “I Met Heine on the Rue Fürstenberg.” A champion monologuist, Feldman had an uncanny ability to dominate the most illustrious company. Six feet tall, and weighing nearly three hundred pounds, he was hard to miss. He attended meetings of the Eighth Street Artists’ Club, the headquarters of the Abstract Expressionists; he made his presence felt at gatherings of the New York School of poets, dancers, and painters, lavishing sometimes unwanted attention on the women in the room; he both amused and affronted other composers. John Adams told me that he once attended a new-music festival in Valencia, California, and stayed at a tacky motel called the Ranch House Inn. When Adams came down for breakfast, he found various leading personalities of late-twentieth-century music, including Steve Reich, Iannis Xenakis, and Milton Babbitt, sitting with Feldman, who proceeded to talk through the entire meal. “A lovable solipsist,” Adams called him. For a time, it appeared that Feldman would be remembered as one of several experimental composers who were gathered around John Cage. In the past two decades, however, his reputation has steadily ascended, even though his works remain rarities on American concert programs. There are well over a hundred CDs of his music, most of it on intrepid small labels such as Hat Art, New Albion, CRI, CPO, and the indispensable Mode Records, which is in the process of issuing parallel editions of Feldman and Cage. According to Villars’s meticulous online discography, all but a handful of Feldman’s hundred and forty published works can be found on CD, and some have been recorded many times; ten pianists have essayed the ninety-minute “Triadic Memories.” The music has found an audience not only among new-music connoisseurs but also among adventurous fans of rock and pop, who are quick to respond to its unearthly power. In a 1982 lecture that is reprinted in “Morton Feldman Says,” the composer asks, “Do we have anything in music for example that really wipes everything out? That just cleans everything away?” If we didn’t before, we do now. Feldman, whose parents came to America from Kiev, grew up in the cosmopolitan New York of the nineteen-thirties and forties, when Fiorello LaGuardia championed high art for the working man and émigré European artists crowded the streets. Feldman studied piano with Vera Maurina Press, a legendary pedagogue who had been a pupil of Ferruccio Busoni. (She is the “Madame Press” who “Died Last Week at Ninety.”) His first composition teacher was Wallingford Riegger, one of the earliest American followers of Arnold Schoenberg. He went on to study with Stefan Wolpe, who, just a few years earlier, had been agitating against the Nazis in Berlin. Young Morty also had several long talks with the expatriate ultra-modernist Edgard Varèse. When you write, Varèse would tell him, think about how long it takes for the sound to travel to the back of the hall. Feldman’s student efforts, which are now showing up on recordings on the Mode and OgreOgress labels, emulate Schoenberg and Bartók, but there is already something unusual in the arrangement of events; as per Varèse’s instruction, Feldman lets loose a striking chord and then lets it reverberate in the listener’s mind. Cage, in 1950, was turning music upside down. He had written works using found-object percussion, “prepared” pianos, turntables, and other gizmos. Soon to come were tape and radio collages, compositions using chance procedures, multimedia happenings, and “4’ 33”,” the legendary silent piece. But it wasn’t the particulars of Cage’s innovations that affected Feldman; gizmos bored him, and he almost always composed for ordinary instruments, to be played in a more or less ordinary way. What floored Feldman was the unswerving unconventionality of Cage’s mind. He now had permission to drop all inherited habits—to become himself. “I owe him everything and I owe him nothing,” Feldman said. In later years, they did not always think alike. Cage would talk about Feldman’s sensuous appeal, in a way that implied a critique: he declared that Feldman’s music was closer “to what we know is beautiful” whereas his own was “closer to what we know is ugly.” Yet the two retained a fraternal bond. Not long after meeting Cage, Feldman opened up his own compositional Pandora’s box, in the form of “graphic notation,” which did away with the routine of writing notes on staves. One day at Cage’s apartment, Feldman produced the first of a series of pieces titled “Projections,” whose score consisted of a grid of boxes. The player was invited to choose notes within the boxes, which represented high, middle, and low ranges. A subsequent series of works, which began appearing in 1957, specified pitches but allowed the performer to decide when and how long they should be played. These conceptual approaches quickly became part of international avant-garde practice, as did Feldman’s habit of using numbered abstractions as titles. Soon enough, composers were filling their scores with patterns, pictures, and verbal instructions, and matters progressed to the logical extreme of Cage’s “Theatre Piece” (1960), during which a piano was slapped with a dead fish. But Feldman had no taste for anarchy. When he realized that his notation could lead to a circus atmosphere—when Leonard Bernstein conducted his music with the New York Philharmonic in 1964, the orchestra joined the audience in hissing him—he turned in another direction. The idea was simply to free music from the machinery of process. Performed in the right spirit, the graphic works sound like the murmur of a crowd in a temple. All the while, Feldman continued to write in traditional notation as well. In pieces entitled “Intermissions” and “Extensions,” he laid out the fundamentals of his aesthetic, which he once defined as vibrating stasis. The sound owed a great deal to the old atonal masters, the Viennese triumvirate of Schoenberg, Berg, and Webern, especially in their dreamier, eerier moods; Feldman’s music is inconceivable without the precedent of the “Colors” movement of Schoenberg’s Five Pieces for Orchestra, with its rotating transpositions of one muted chord, or the funeral march of Webern’s Six Pieces for Orchestra, with its misty layers of winds and brass over drum rolls. What Feldman did was to slow the pace of events in the Schoenbergian universe. Schoenberg was, above all, an impatient man, who had to keep scurrying on to the next novel combination of sounds. Feldman was patient. He let each chord say what it had to say. He breathed. Then he moved on to the next. His textures were daringly spare. On one page of “Extensions 3,” he used a mere fifty-seven notes in forty bars, or fewer than two per bar. In confining himself to a minimum of material, Feldman discovered the expressive power of the space around the notes. The sounds animate the surrounding silence. 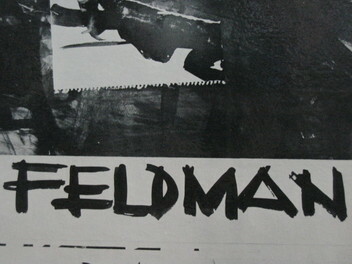 Working nine to five in the garment business, Feldman proudly maintained his independence from the professional herd. He mocked the university composers who tailored their work for fellow-analysts, the tonal composers who tried to please orchestra audiences, the inventor-composers who unveiled brand-new isms each summer at the state-funded European festivals. “Innovations be damned,” he snapped. “It’s a boring century.” In 1972, he obtained his post at SUNY Buffalo, but he continued to insist that composition could not be taught, that it should not be professionalized. He loved to challenge students’ assumptions about what ideas were au courant, about which composers were radical and which were conservative. He proclaimed, for example, a love for Sibelius, who had long been derided in progressive circles as a retrograde Romantic. When I visited the small archive of Feldman papers at SUNY Buffalo, I came across an exam paper in which the composer asked his students to analyze Sibelius’s Fifth Symphony alongside Webern’s Concerto Opus 24. How the would-be revolutionaries of the day must have scratched their heads over that! Another assignment was to write a piece for soprano and string quartet, using a text from the Buffalo Evening News. In his last years, from 1979 until 1987, Feldman again swerved away from the mainstream. He inaugurated his compositions of long duration, those which went on for an hour or more. Even the most devoted fans may wish to admit that there was an element of runaway grandiosity in these Wagnerian demands on the listener’s time. Feldman plotted his immortality with some deliberation—this was the man who intended to become the first great Jewish composer, ruling out Mendelssohn, Mahler, and Schoenberg—and he evidently saw this series of pieces as his tour de force, his run for home. (“I’m on third base,” he boasted in 1982.) Yet there was also a practical need for a drastic enlargement of scale. It allowed his quiet voice to be heard in the total isolation that it required. Feldman’s shorter works make an awkward effect on standard concert programs, particularly when the audience coughs and rustles its puzzlement aloud; they don’t play well with others. The long works create an overarching, protective space around a vulnerable huddle of sounds. The composer Kyle Gann, in his brilliant new book, “Music Downtown” (California; $19.95), describes how you end up living with Feldman’s music as you would with a painting on your wall. Extreme length allowed Feldman to approach his ultimate goal of making music into an experience of life-changing force, a transcendent art form that wipes everything else away. To sit through performances of the two biggest works—I heard Petr Kotik’s S.E.M. Ensemble play the five-hour-long “For Philip Guston” in 1995, with phenomenal purity of tone, and the Flux Quartet play the six-hour-long “String Quartet (II)” in 1999, with tireless focus—is to enter into a new way of listening, even a new consciousness. There are passages in each where Feldman seems to be testing the listener’s patience, seeing how long we can endure a repeated note or a dissonant minor second. Then, out of nowhere, some very pure, almost childlike idea materializes. Most of the closing section of “For Philip Guston” is in modal A minor, and it is music of surpassing gentleness and tenderness. But it inhabits a far-off, secret place that few travellers will stumble upon. In his last years, Feldman became unexpectedly wealthy. He inherited some money from his family, and he received increasing royalties from Europe, where his music was always better understood. Most significantly, he made a small fortune by selling art. Back in the fifties, he had bought a Rauschenberg canvas for seventeen dollars, because that was what he had in his pocket at the time. Shortly before his death, he sold it for six hundred thousand dollars. He became a collector of antique Middle Eastern rugs, whose subtly varied patterns affected his late style. Curmudgeonly and generous by turns, he picked up dinner tabs for hungry young composers. His final works radiate an enormous, ominous serenity: “Piano and String Quartet” (which Aki Takahashi has recorded beautifully with the Kronos Quartet, on Nonesuch), “Palais de Mari,” for piano (played by Takahashi on her mesmerizing Mode CD of early and late piano music), and “Piano, Violin, Viola, Cello” (recorded with icy clarity by the Ives Ensemble, on Hat Art). That piece, the very last, makes repeated, wistful references to Debussy’s Prelude “Des Pas sur la neige,” or “Steps in the Snow.” Pancreatic cancer took Feldman quickly. One day, he was unavoidably there, monopolizing the room; the next, he was gone. If there is a Holocaust memorial in Feldman’s work, it is “Rothko Chapel,” which was written in 1971, for Rothko’s octagonal array of paintings in Houston. Rothko had committed suicide the previous year, and Feldman, who had become his close friend, responded with his most personal, affecting work. It is scored for viola, solo soprano, chorus, percussion, and celesta. There are voices, but no words. As is so often the case in Feldman’s music, chords and melodic fragments hover like shrouded forms, surrounded by thick silence. The viola offers wide-ranging, rising-and-falling phrases. The drums roll and tap at the edge of audibility. Celesta and vibraphone chime gentle clusters. There are fleeting echoes of past music, as when the chorus sings distant, dissonant chords reminiscent of the voice of God in Schoenberg’s “Moses und Aron,” or when the soprano sings a thin, quasi-tonal melody that echoes the vocal lines of Stravinsky’s final masterpiece, the “Requiem Canticles.” That passage was written on the day of Stravinsky’s funeral, in April, 1971—another thread of lament in the pattern. But the emotional sphere of “Rothko Chapel” is too vast to be considered a memorial for an individual, whether it is Rothko or Stravinsky. Shortly before the end, something astonishing happens. The viola begins to play a keening, minor-key, modal song, redolent of the synagogue. Feldman had written this music decades earlier, during the Second World War, when he was attending the High School of Music and Art, in New York. Underneath it, celesta and vibraphone play a murmuring four-note pattern, which calls to mind a figure in Stravinsky’s “Symphony of Psalms.” The song unfurls twice, and the chorus answers with the chords of God. The allusions suggest that Feldman is creating a divine music, appropriate to the sombre spirituality of Rothko’s chapel. In a sense, he is fusing two different divinities, representative of two major strains in twentieth-century music: the remote, Hebraic God of Schoenberg’s opera, and the luminous, iconic presence of Stravinsky’s symphony. Finally, there is the possibility that the melody itself, that sweet, sad, Jewish-sounding tune, speaks for those whom Feldman heard beneath the cobblestones of German towns. It might be the chant of millions in a single voice. Only this one time, in the last minutes of “Rothko Chapel,” did Feldman allow himself the consolation of an ordinary melody. Otherwise, he held the outside world at bay. Yet he always showed an awareness of other possibilities, a sympathy for all that he chose to reject. Listening to his music is like being in a room with the curtains drawn. You sense that with one quick gesture sunlight could fill the room, that life in all its richness could come flooding in. But the curtains stay closed. A shadow moves across the wall. And Feldman sits in his comfortable chair.